See Sarah Swatch: I'm Back! Hi, sorry about that absence, I've had a rough week and then got sick on top of everything, but I'm back now with my favorite polish of the moment. So you all know I have a love affair with glitter, just take a look at my recent posts haha. But recently, I've been craving really good cremes. My manis over the past 2 weeks-ish have been Essie Orange, It's Obvious!, China Glaze Poinsettia, Finger Paints Lemon Sour, RBL's IKB:2012, and now Essie's Who is the Boss ! I'm actually in love with this color, it looks so good on the nail. I looked for this collection for a while but I couldn't find it until I got right to the register at Harmon's. I was in a bit of a hurry, so I didn't have time to really look at all the colors from the display [and the Essie Poppy Razzi display too!!] so I just grabbed WitB and decided I'd have to come back later to look. 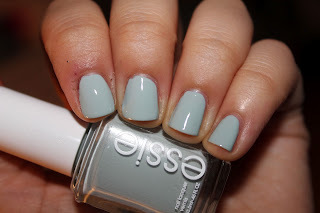 I want a lot of the new Essies, but till then I'll have to admire from afar haha. Anyway, I'm so glad I picked this one up, the formula was great for me and it's opaque in 2 coats, great for a lighter color like this. Yep, I'm in love. Then there's the not so in love with part. 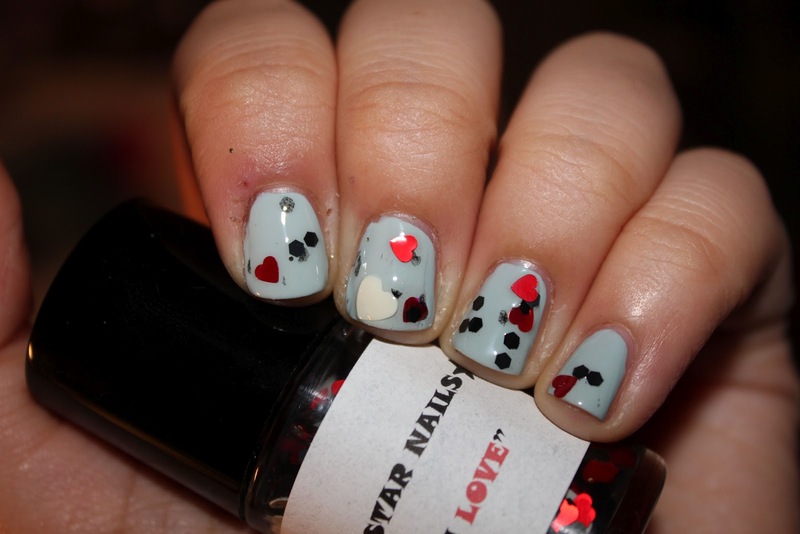 I put on Rockstar Nails' With Love, and to be honest, I was a little disappointed. I love the hearts, but there's something weird going on with that black hex glitter [see index finger] and I really really had to fish for a large white heart. It looks like the black hexes like... deteriorated or something? I don't even know, but they turned translucent in some paces and looked strange. not my cup of tea, unfortunately:/ But you win some, you lose some, right? I love blue shades like this! It's really pretty. The glitter is nice too! welcome back! who's the boss is hot.. need that! I love this!!! Super cute! Glad to have you back honey. Love this color! I can't wait to try my bottle of it. Too bad about the Rockstar polish though. :-/ Good to see you back in action! thank you<3 and yeah, that rockstar... eh.